Mon. #1 is HERE. Please follow us on Tumblr or Twitter, subscribe to us on YouTube or like us on Facebook. Don't miss the WWE Raw highlight videos later tonight! With the cheap plugs out of the way here's Monday's latest wrestling news. The YouTube subpocalypse is for real and my YouTube channel could use your support. I need 1,000 subscribers to survive and it's at 757 subscribers right now, an increase from when the bad news broke, but I still need 243 more. While the revenue generated is small compared to a Game Grumps or a NoDQ it's still very much necessary to keep our operation running. Please subscribe to Mistah MegaManFan and help me out! The NWA has announced Cody Rhodes will defend his world title against Willie Mack on September 29th. In her latest column, Natalya talks about teaming with Kevin Owens on MMC: "When I found out I'd be teaming up with Kevin, I asked myself, 'What do we have in common?' I realized a few things: we both are from Canada, are very family oriented, have competed around the world before ever coming to WWE, are inspired by Owen Hart, have a spoiled Persian cat who we shamelessly Facetime on the weekends, both like to powerbomb our opponents and we both enjoy poutine. That was a mouthful! Well, maybe we aren't as different as we thought! I'm excited to see what we bring out of one another as we team up for the new season of Mixed Match Challenge. I know one thing for sure, both of our cats will be watching live on Facebook Watch." The reaction of fans to the finish of WWE Hell in a Cell was... not kind. Here Batista talks about his days as a bouncer: "I found my way into bouncing at nightclubs, really young. I started bouncing in nightclubs when I was 17. And it's funny I was still in high school bouncing in nightclubs and all my friends who were too young to drink would come down to the nightclubs I was working in and of course I would let them in. Then I spent all of my twenties just wasting away, you know pursuing becoming huge and bouncing in nightclubs and making easy money. I kind of got wrapped up in that life that just led to nowhere. When I kind of reflected and thought, 'What could I do with myself?' I don't have an education. I don't really have any training or job training but I have this great big huge body and I thought 'I'll be a professional wrestler.'" NWA Champion Cody made his first appearance at the 9/16 Championship Wrestling from Hollywood TV taping at the Oceanville Pavilion in Port Hueneme, CA. David Marquez started the show, welcoming and congratulating Cody on ALL IN and winning the NWA championship. Cody explained that while he will be free agent in January, he doesn't plan on losing it the championship. "The rules of the NWA say I can take this championship wherever I want. I can defend it in my home promotion of Ring of Honor or I could defend it on Monday Night Raw". Marquez reminded Cody he has an announcement to make. Cody says that he will be defending the NWA World's Heavyweight Championship against CWFH Heritage Heavyweight Champion Willie Mack at Ring of Honor's return to Las Vegas on 9/29. "Professional" Peter Avalon came out and says he didn't get his promised title shot vs. Nick Aldis at Championship Wrestling from Arizona because Nick Aldis said he had "traveling issues" and didn't make the town. Avalon feels he deserves a shot before Mack. Cody tells Avalon that it is not his decision, it is the NWA's decision. Cody says that since there will be no match in these situations we just fight. He grabs Avalon and hits Cross-Rhodes. Cody holds the World's Heavyweight Championship over his head and leaves. After the tapings Cody met with fans taking pictures and giving the fans some time to tell him their stories. * The Agents of Chaos defeated RockNES Monsters. * Hobo defeated Osiris Mittens. * Watts & Andy Brown defeated Tyler Bateman & PPAvalon. * Chris Bey defeated Douglas James. * UWN Television Championship: Oliver Grimsley defeated Adrian Quest. * Outlandish Zicky Dice defeated Bad Dude Tito by DQ. * Nick Aldis defeated Royce Issacs. * Heather Monroe vs ?. * Scorpio Sky and David Arquette attended but did not appear on the card. In this interview Renee Young talks about her WWE audition: "It's so crazy to think about where I was in my life, in my career, before walking into that audition with WWE. I thought I had a terrible audition, and I was like, 'There's no way that went well, right?' And lo and behold, they said I could work there anyway. I never in a million years would have thought this would have been an option." Here Matt Riddle talks about whether or not he misses MMA: "I do miss it. I watch the fights. I watched Tyron Woodley dominate this week. I feel bad for the fighters and I know exactly - things are a little different now - but I know my world when I was in MMA, everything was tough. Life was just so tough. Everything was a struggle. Bills were a struggle. Even when you're on top in the UFC, you only get paid a couple times a year. I'm just really glad to have that all behind me and focus on my craft." 3:00 PM ET. New WWE videos above have been updated. 5:00 PM ET. Eli Drake isn't sure if he's interested in WWE: "I don't know, and the reason I don't know is I've had a strange crossroads with this business over the last couple of years. It's changed a lot, it doesn't feel like the same business I fell in love with 20-30 years ago. But that's not to say that I can't still do my own thing my own way, that's exactly what I've always done and that's what I'll continue to do. But wrestling has changed in a lot of ways and not for the better, in my opinion. But again, if I could continue doing my thing then who knows? We'll see what happens, and if I feel like I want to continue doing that at a much more exaggerated pace, as far as the schedule and what not." Jay Lethal will defend his ROH World Title against Will Ospreay on 9/28. If you care either way Nikki Bella says she and John Cena are still friends. Awwwww. 7:00 PM ET. 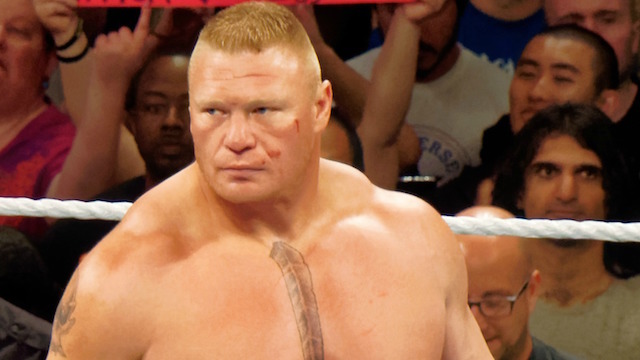 Brock Lesnar will reportedly get a seven figure payment for his next WWE match in Saudi Arabia.